Can’t choose between a slide or a bounce house? You don’t have to. Combo units feature both a bouncing area and a slide! 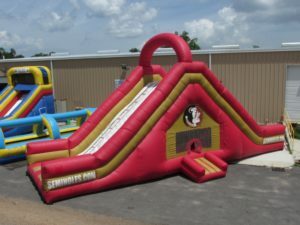 Get a dry slide, like the Seminole Bounce ’n’ Slide, so you can go straight from the tailgate to the game without a wardrobe change. 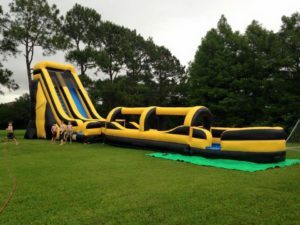 Combo units range in height from 12′ to 20′, so your inflatable isn’t just a slide, it’s a thrill ride. Don’t let your neighbors mistake you for a fair-weather fan! Our local team-themed inflatables will make your allegiances clear. 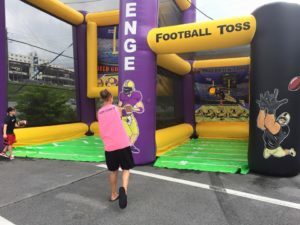 You can throw, punt, or kick to glory with the Football Challenge. Everyone will be impressed by a tight spiral tossed right through the target on the throwing challenge. Can’t find the right touch? Take out your frustration on the ball with a big punt on the kicking challenge! More of a fútbol fan than a football fan? See if your skills cross over, attempt to split the uprights with a field goal kick! It is often said that ‘less is more’. 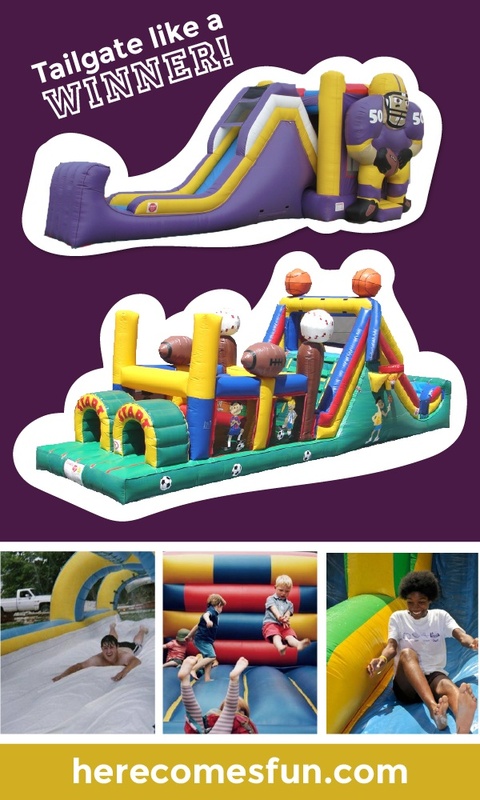 The Football Bouncer is a back-to-basics bounce house, with enough room to fit eight bouncers at a time. Want to let your neighbors to know what you’ll be watching on Saturday or Sundays? 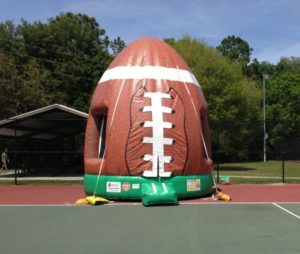 Nothing says ‘football season’ like a 15’ tall pigskin blown up in your backyard! Recreate the sights and sounds of a gameday tailgate by grilling up your favorite protein out back after the bouncing has begun. Can’t make it back to campus for the big game? Bring the collegiate spirit to your backyard with a team-themed water slide. There’s only a few weekends of water slide weather left, take advantage of them by throwing a “bring-your-swimsuit” barbecue. If you’re more of a pro football fan, we have options for you too – why do you think we call our 20’ black & yellow slide The Saintsation? Space Walk offers all-day rentals, so the fun doesn’t stop after only a few hours. Pre-game with a thrilling ride, watch the game, then hop back on the slide for another stomach-dropping dive. Whether celebrating a big win, or mourning a heartbreaking loss, an 18 foot plunge is the perfect cap to a great game day event. Next PostNext The Secret to Easier-Than-Ever Party Hosting: Put Your Crock Pot to Work!